The chassis number is the key data for identifying your car. On all T-types it is stamped on the near-side dumb-iron or chassis extension. This number should agree with the chassis number (or car number) stamped on the plate(s) riveted to the battery/tool box or bulkhead under the bonnet of the car. For models TA/TB/TC there is no problem because there are no prefixes used; the chassis numbers run from TA 0253-3255, TB 0252-0630 and TC 0252-10251. Some historians might dispute this, but it seems that the prototype TAs were numbered 0251 and 0252, while the prototype TB and TC were numbered 0251 and were not counted as production cars. For the TD there were two types; plain TD and TD/C, the ‘competition’ version with bigger valves and carbs and stiffer front suspension. This latter is also called the Mark II and hence often confused with the code TD2, which formed part of the engine codes of cars produced after about chassis number 10000, and signifying a larger clutch. The TD chassis numbers are from 0251 to 29915. TDs also had extra codes for export cars, EXR and EXL for RHD and LHD respectively. To this was added either “U” or, for later TDs, “LNA” for cars destined for North America. HD stands for M.G. 2-seater in the BMC scheme of things. A = Black, B = Light Grey, C = Dark Red, E = Mid Green, P = Ivory. 1 = U.K. RHD, 2 = Export RHD, 3 = Export LHD., 4 = North America LHD. 3 = Cellulose, 5 = Primer, 6 = Cellulose Body, Synthetic Wings. The chassis stamping was TF plus chassis number (the ‘TF number’) whereas on the identification plate the car number was used. Thus, for example, HDE 23/10081 is a R.H.D. export model (it went to S. Africa) painted in green cellulose (it still is) and almost the last TF made (in May 1955). The engine should have an octagonal, circular or square plate riveted to the left-hand side of the engine flywheel cover for the TA/TB/TC and possibly the Y & YT before the TD was introduced, or just forward of the exhaust manifold for the later Y, TD, YB & TF, on which the engine number will be stamped. The original engine number will also appear on the car identity plate on the bulkhead, with export LHD TDs and Y types, except for the YT, having LHX before the actual number. 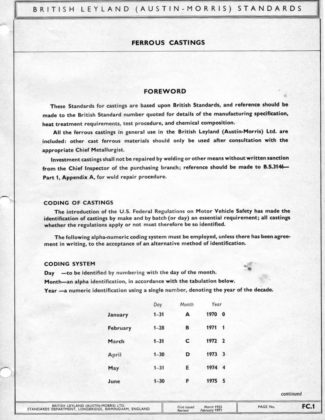 • TB and TC engines, oval water holes and a 7¼” clutch, were coded XPAG/…..
• TD and TD Mark II engines, oval water holes and a 7¼” clutch, were coded XPAG/TD/…. • TD and TD Mark II engines, oval water holes and an 8″ clutch, were coded XPAG/TD2/…. • TD Mark II engines, round water holes and an 8″ clutch, were coded XPAG/TD3/…..
• TD engines, round water holes and an 8″ clutch, retained the code XPAG/TD2/…. • TF 1250cc engines, round water holes and an 8″ clutch, were coded XPAG/TF/…..
• TF 1500cc engines, round water holes and an 8″ clutch, were coded XPEG…..
eg. XPAG/TD/LHX…., but this normally only appeared on the bulkhead plate. A large number of cars with XPAG or XPEG engines have had Morris Motors or BMC (Gold Seal) replacement engines fitted. These usually did not have an XPAG number on an octagonal plate, but instead a letter prefix (A, B, C, E, G & RS have been seen) followed by a larger than usual number (E99794 has been seen) on a square ‘replacement engine’ plate. With replacement engines, the original number of that engine can sometimes be deciphered just above or covered by the square plate, stamped on the block. Be prepared to find, however, that the engine in your T type might have started life in a Y type, or vice versa! 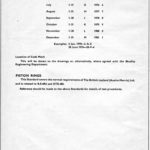 Roger Wilson has also written a researched and more extensive explanation of changes made to XPAG/XPEG engines which relate to the head and block casting numbers. This pdf file has lots of photographs of existing blocks and heads together with a link to an album of photos showing you what to look for, including the casting marks about which we now have some new information, including the W-in-a-diamond mark found on later XPAG and XPEG blocks. Our thanks are due to David Braun, Chris Collingham, Bob Douglas, Barrie Jones, Graeme Louk, Bill Silcock, Mike Stone, Mark Tullett, Arthur Vowden and Barry Woolford for contributing photos. There is also a full album of photos of casting marks with a description of each available. XPAG and XPEG blocks weren’t the only engine blocks cast at the Wellingborough Ironworks and lots of components for Nuffield tractors were made there too. 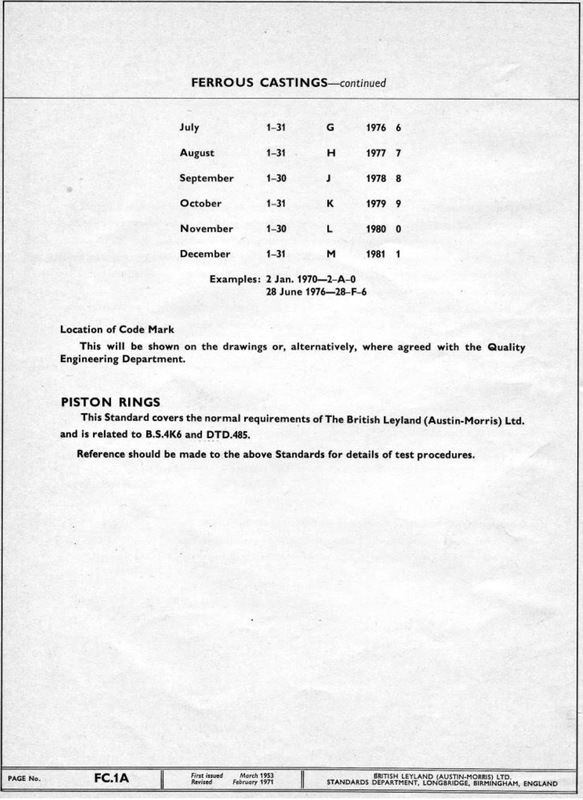 We also now have some new information, courtesy of the Nuffield and Leyland Tractor Club and John their historian in the form of an Austin Morris standard for casting the date coding on blocks and heads, and although the document is from 1971, it is a revision of an original 1953 standard. It’s our first real piece of evidence of how to decipher the date coding found near the dipstick on blocks, and on heads to the rear on the same side as the casting number. 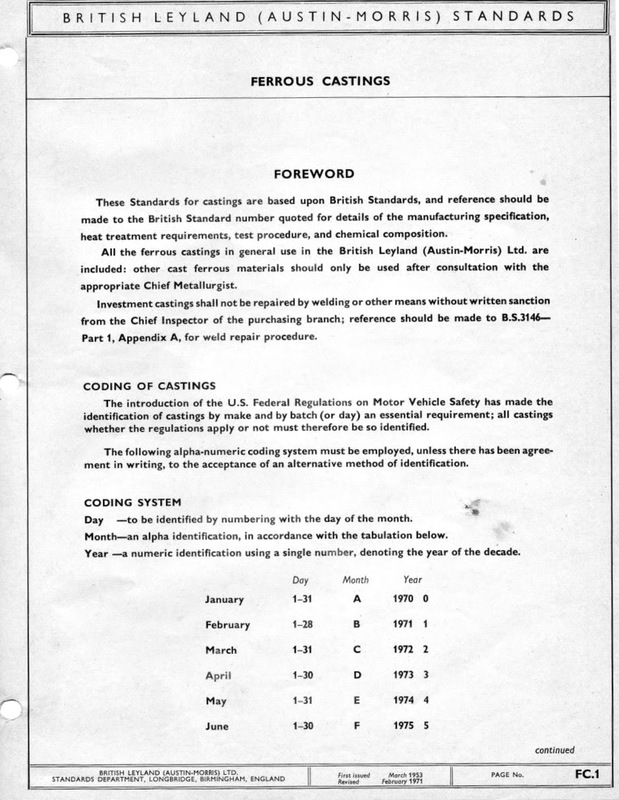 Because of this document, we now have a reasonable working table to decode the casting dates of blocks, although it is not perfect: we have seen blocks with more letters or numbers than match our table and these are being investigated. This information will be updated as soon as we have more information, but in the meantime if you can send us a picture of the coding near the dipstick on your engine we’d be most grateful: we need more information!